Professor Meenakshi Narain's research interests are in experimental high energy physics and her ultimate goal is to illuminate the character of physics at the TeV energy scale. At the loftiest level, it is part of the age old quest of mankind to understand where we come from and why we are here. Meenakshi Narain has been involved with the CMS experiment at the Large Hadron Collider at CERN (Geneva, Switzerland) and the DØ experiment at Fermilab (Batavia, IL). She was instrumental in the discovery of the top quark in 1995, which is the heaviest fundamental particle and as heavy as an Osmium atom. Narain continues her quest at the LHC with the CMS experiment. In 2012, Narain’s group had significant involvement in the discovery of the Higgs Boson. Narain continues her quest at the LHC with the CMS experiment. 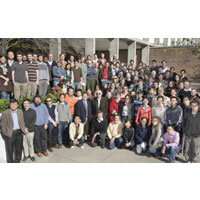 In 2012, Narain’s group had significant involvement in the discovery of the Higgs Boson. Narain was elected Chair of the USCMS Collaboration Board in June 2018 for a two-year term. In this capacity, she represents the US members collaborating on the CMS experiment in LHC. The US contingent includes ~1200 members (scientists, students, and engineers) from 48 universities and 2 national labs in the US, which constitutes about 27% of the international CMS collaboration. She is a member of he Management Board of the international CMS Collaboration as the representative of the US collaboration. This board is the highest governing body of the CMS Collaboration. Narain served as the “Convener of Upgrade Physics and Performance Studies Group (HL-LHC)" for the international CMS experiment from February 2016-December 2018. In Jan 2013, Narain was appointed the coordinator of Fermilab's LHC Physics Center for CMS, where she has promoted collaboration with colleagues from South America, Europe, India, and Iran, in a peaceful quest for knowledge. Narain has been engaged in STEM outreach activities to encourage participation of young women in science. Prof. Narain serves as a member of the "Diversity Committee" of the CMS Experiment. She served as the founding chair of this committee from September 2017-August 2018. She is an informal mentor and faculty advisor of the Physics Department WiSE group. She is on the advisory comittee of the university GWiSE. Prof. Meenakshi Narain received her PhD in physics from the State University of New York at Stony Brook. She joined the Brown faculty in 2007 having previously taught at Boston University. Narain is a Fellow of the American Physical Society. She has been a Wilson Fellow at Fermilab and has received a Professional Opportunities for Women in Research and Education grant, Major Research Infrastructure grants, and the CAREER Award from the National Science Foundation. She is also a recipient of the Outstanding Junior Investigator Award from the US Department of Energy. Her current research is supported by the DOE. She is a co-author on about 400 peer-reviewed journals, and has given numerous public lectures and invited conference presentations. As the discovery of the Higgs Boson has also brought particle physics into a new era, Narain refocused her research to study this new particle . She and her team are working on studying the properties of the Higgs Boson and its implications. She also is interested in uncovering new signals such as a neutral heavy gauge boson, or a heavy partner of the Top quark, anticipated by models to stabilize the mass of the Higgs Boson. Narain is co-leading the effort to establish the vision and studies for physics and the upgrade of the CMS detector for the High Luminosity upgrade of the LHC in 2023. In 2013, Narain led many of the studies which formed the basis of the snowmass 2013 community study report as input to the P5 committee defining the priorities of US particle physics projects. Narain is engaged in R&D towards the construction of the tracking detector, made from silicon sensors, which forms the innermost part of the CMS experiment. This detector provides a precise measurement of the momentum of the charged particles produced in the collision. Her lab is one of the sites selected for the construction of silicon strip tracker for CMS operations at HL-LHC. Media coverage of her role at the LHC in finding the Higgs Boson can be obtained on request. Narain’s research impacts society on many levels. Addressing questions at the microscopic scale and beyond has always required innovation. The CMS experiment is extremely demanding in terms of equipment design, and generates novel technical approaches which ultimately benefit society. On a more practical level, research in particle physics drives technology to the edge and many of its spinoffs are commonplace today – to name a few clichés… such as accelerators for cancer therapy and the www protocol. The diverse technological and analytical training spanning engineering, mathematics, computing and electronics obtained in an international and collaborative environment is much sought after in many commercial sectors. The efforts of the LHC experiments in distributed computing link Grid computing with cloud computing, an invaluable tool for big data analysis. Narain has been involved in outreach to promote science education at all levels. She continues to invest her time to mentor the educators and establish resources to establish opportunities for young scientists in rural India, specifically in UP, with the aim of promoting a world class culture of scientific research in colleges. Particle physics is data intensive science- we gather 1 PB/sec, i.e. 1million GB/sec! Recipient of Professional Opportunities for Women in Research and Education grant, Major Research Infrastructure grants, from the National Science Foundation. Co-Chair, 25th Anniversary Conference of the ICISE, Aug 2018, Quy Nhon, Vietnam. Visiting Researcher (June-Aug 2009), IPHC, Strasbourg, France. Member of the CMS experiment at Fermilab.